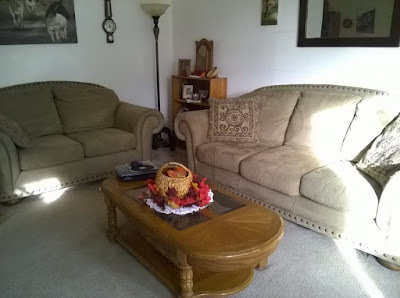 Not many times am I able to take pictures of my house, when its clean. I thought I would share some pictures, just before the family came over. 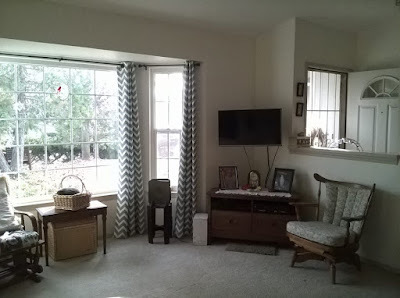 It's not PERFECT - but now I can point out what I am wanting to do - One day I would like to take photos of my house when I am done with all the decorating. Like glamour shots for my house. Fairly picked up, except for the dog-toy! The Burl-clock was given to me by my parents. The glider-chair was my parents, and needs a pillow. The organ bench belonged to my mom. The sofa and loveseat I bought off Craigslist last year. The end tables and coffee table used to belong to my parents. 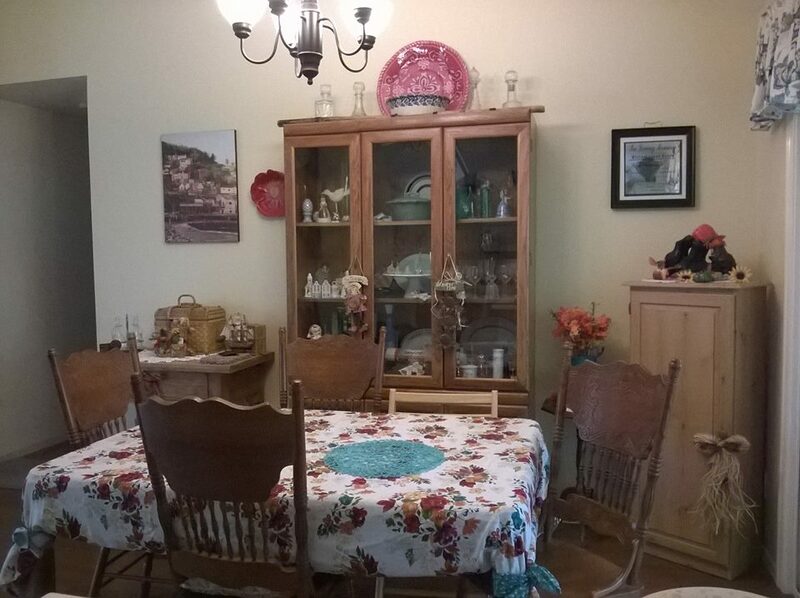 The little bookcase in the corner belonged to mom. A HS kid made it for my mom and we always had it in our house - the clock on the bookcase belonged to my Grandma and Grandpa. I am bothered by the TV set and the wires. I can't "hang" with that! 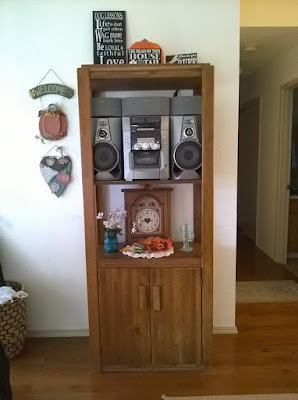 I'm thinking of putting some wood, nail it to the back of the tv stand, you know, make it look all nice, like it belongs there - just to hide those annoying cords. It's a work in process - or soon will be. I could put some plants there - ANY SUGGESTIONS? My dining rooms, no matter where I have lived, have always been my favorite room in the house. I like it to be homey. STORY behind the extra large tablecloth = I bought it at Walmart - it is part of the Pioneer Womans line of merchandise. I picked up the wrong size and threw away the receipt. So I just had to use cloth napkins to tie them to the leg of the dining table. It worked. 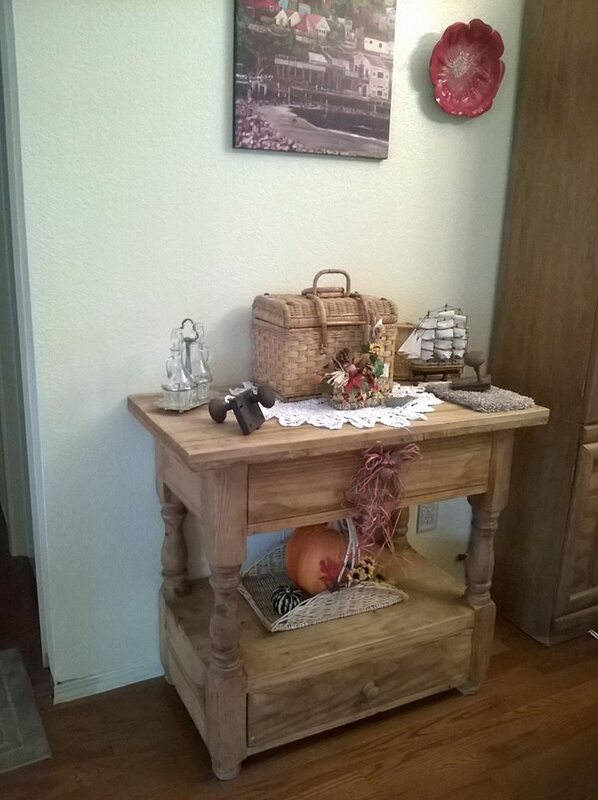 I love that side table! I got it for FREE. The family, I used to Nanny for, gave it to me. I love the rustic wood. Would love to get more pieces one day. They had it shipped from Mexico. Thepainting is from a friends daughter who painted my hometown beach in Pacifica. and the little flower bowl was purchased at a art show for developmentally disabled adults - Fred made this and was so pleased that someone bought it. I love it! You can't really tell from the photos, but the walls are yellow. 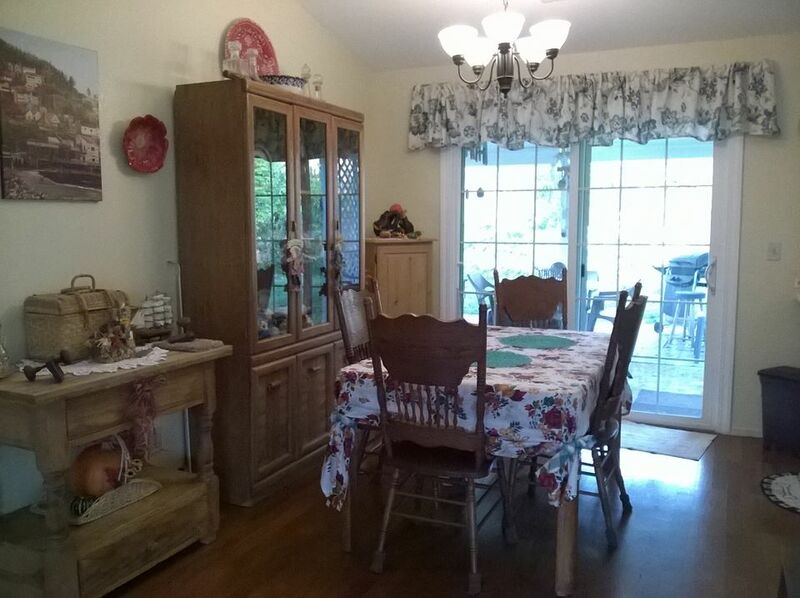 That china cabinet I've had since the late 70's and the table, my boys use to sit and do their homework on it. Except for the chairs. I keep everything and if I can't use it, I store it in my garage - until I can find a good use for it. I hardly ever sell. Usually when I am fed up and have held on to it for years, I end up giving it away to a good home. 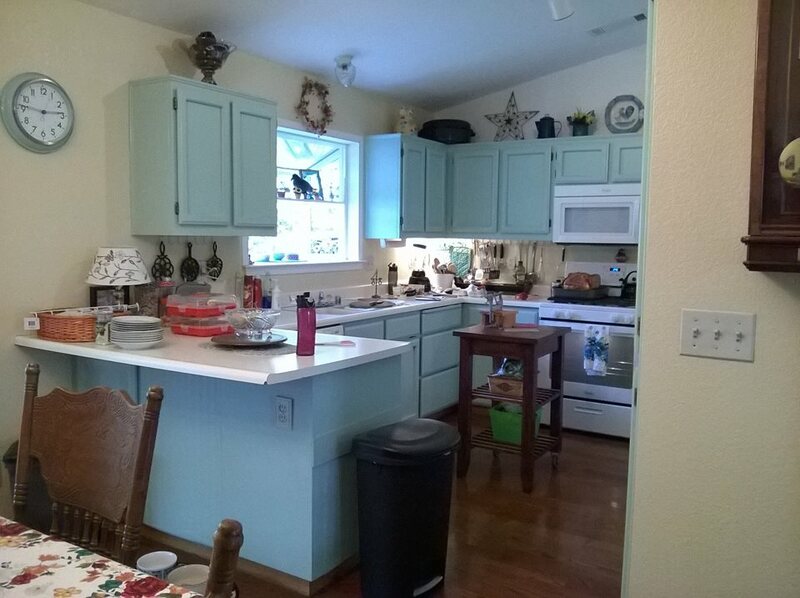 Last year, I painted my kitchen and the walls. We plan to put in wood countertops and a farm sink. We added the greenhouse window this past year. I also bought a new stove and over-the-range microwave. I wanted to keep that retro/farm look. I don't know what my style is - I like cheap and shabby! This is my problem area. We want to make a useful entry way, with umbrella holder and coat racks. Whenwe have people over, we don't have a goodplace to store these items. I don't want furniture there - I'm thinking, using beadboard - and then make a simple rack on it - maybe a upper shelf and then get a nice umbrella stand. Thats it. So many fun home projects are in my future. I love your house. Very homey! Those kitchen cabinets are 'to die' for. Love them. 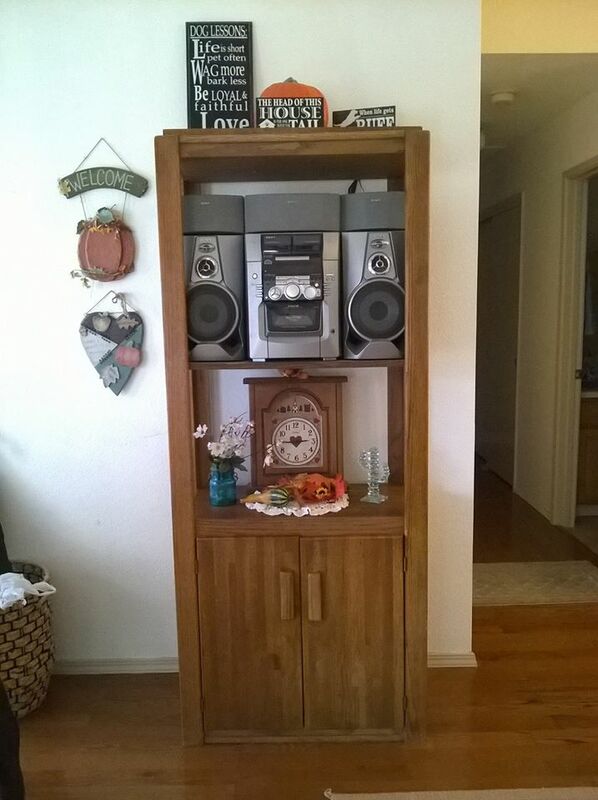 I wish I had room in my dining room for my hutch. It has to stay, for now, in the reading room. I also love how you dealt with the too big tablecloth Very clever. This makes me want to get some good pictures of my house! Maybe after my Christmas decorating and cleaning is all done!! Its funny. 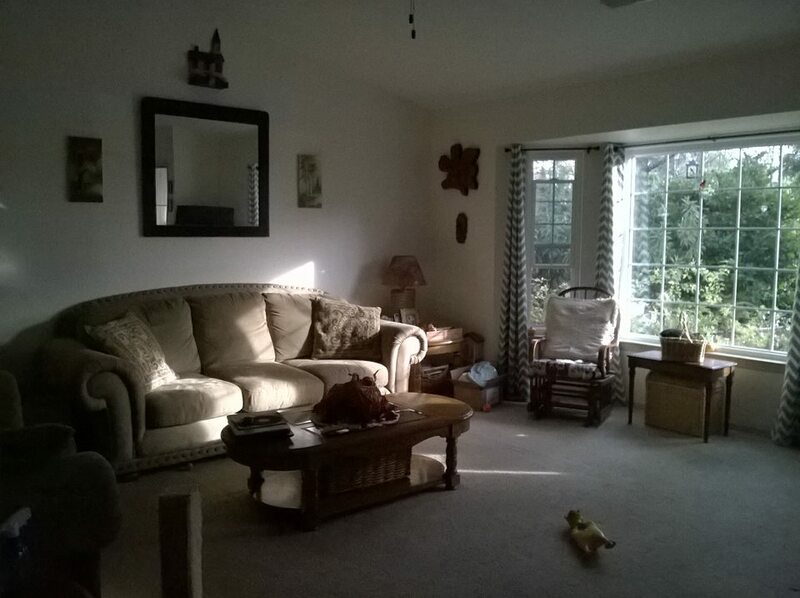 You take photos of your house and upload it on your blog, and it looks different - A totally different perspective. Post pictures of your Christmas decorations and all. Gives everyone ideas.